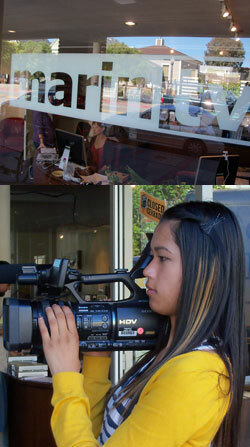 Your donations are essential to CMCM's youth efforts to support and expand the Marin Media Corps. Your contribution will help Marin youth gain invaluable experience in media production and also contribute to the creation of more youth produced local programming for Marin TV! The Marin Media Corps immerses students in a professional working environment and fosters their skill and creativity in the production of media about significant events in arts, science and culture. Much like the CMCM's successful Summer Sports Broacast Camp, the Media Corp will provide youth with same year-round professional experience they just can't get elsewhere. Our recommended individual donor levels are $50, $100, $250 and $500, but any amount is extremely helpful. The Community Media Center is a 501c3 non-profit and all your donations are tax deductible. To make an individual donation by check or credit card, just go here! If you are a business donor and would like to support the Marin Media Corps and also underwrite one or more of the Marin TV channels, please fill out this online form and we'll be in touch! Hire the MMC coming soon!